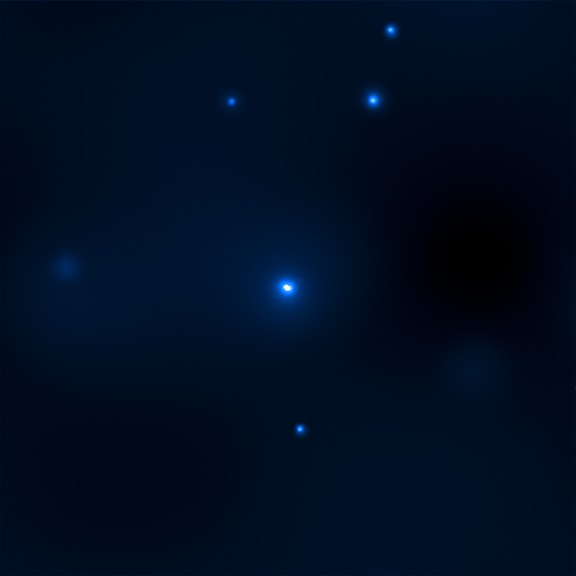 The main component of this graphic is an artist's representation of M33 X-7, a binary system in the nearby galaxy M33. 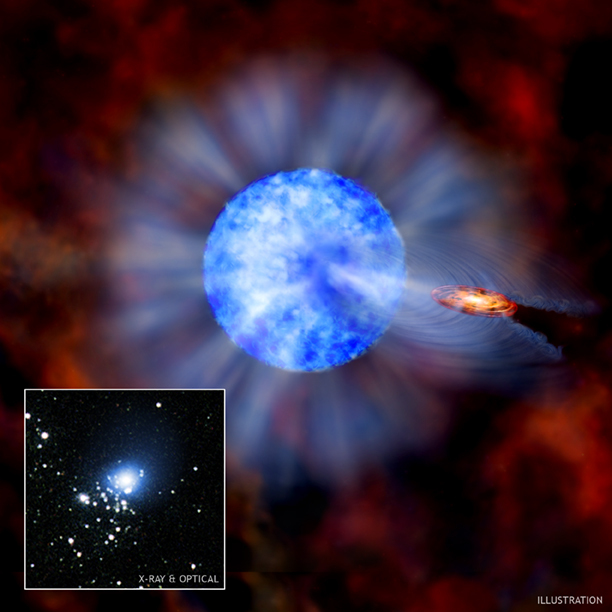 In this system, a black hole is revolving around a star about 70 times more massive than the Sun (large blue object). This black hole is almost 16 times the Sun's mass, a record for black holes created from the collapse of a giant star. Other black holes at the centers of galaxies are much more massive, but this object is the record-setter for a so-called "stellar mass" black hole. In the illustration, an orange disk surrounds the black hole. This depicts material, fed by a wind from the blue companion star, which has been swept into orbit around the black hole. Rather than flowing unimpeded and uniformly into space, wind from the star is pulled towards the black hole by its powerful gravity. The wind that does make it past the black hole is disrupted, causing turbulence and ripples beyond the disk. The companion star itself is also distorted by the gravity from the black hole. The star is stretched slightly in the direction of the black hole, causing it to become less dense in this region and to appear darker. The inset shows a composite of data from NASA's Chandra X-ray Observatory (blue) and the Hubble Space Telescope. The bright objects in the inset image are young, massive stars around M33 X-7, and the bright, blue Chandra source is M33 X-7 itself. X-rays from Chandra reveals how long the black hole is eclipsed by the companion star, which indicates the size of the companion. Observations by the Gemini telescope on Mauna Kea, Hawaii track the orbital motion of the companion around the black hole, giving information about the mass of the two members of the binary. Other observed properties of the binary were also used to help constrain the mass estimates of both the black hole and its companion. Credit Illustration: NASA/CXC/M.Weiss; X-ray: NASA/CXC/CfA/P.Plucinsky et al. ; Optical: NASA/STScI/SDSU/J.Orosz et al. Coordinates (J2000) RA 1h 33m 34.12s | Dec +30° 32´ 11.6"